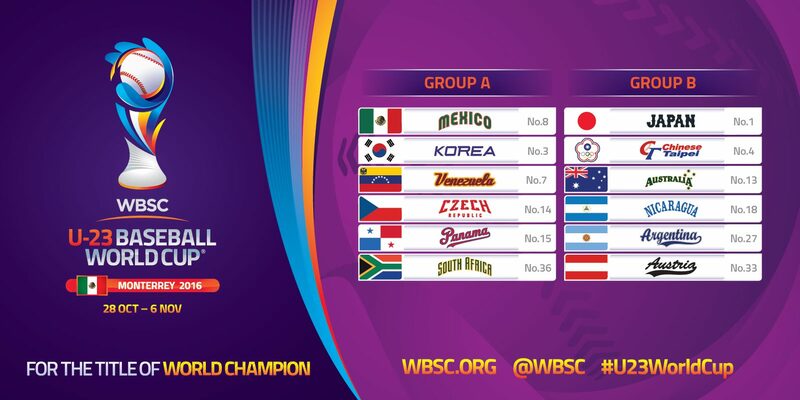 （September 18, 2016, LAUSANNE, Switzerland） -- The World Baseball Softball Confederation today unveiled the Groups and Official Look of the inaugural WBSC U-23 Baseball World Cup®, which will be staged in Monterrey, Mexico, from 28 October to 6 November. For the Opening Round group stage, the 12 nations competing For the Title of World Champion in the U-23 category have been drawn into two groups of six, with the top three finishers from each global group advancing to the Super Round group stage. Group A features three nations from the Americas, including host nation/world No. 8 Mexico, No. 7 Venezuela and No. 15 Panama. Asia representative Korea is the highest-ranked nation in the group at No. 3 in the world. Europe and Africa representatives -- No. 14 Czech Republic and No. 35 South Africa -- will also compete in Group A. World No. 1 Japan and No. 4 Chinese Taipei headline Group B. These two Asia representatives advanced to the world championship Final of the U-21 Baseball World Cup 2014 in Taichung, Taiwan, which was won by Chinese Taipei. No. 13 Australia (Oceania), No. 18 Nicaragua and No. 27 Argentina (Americas), and No. 33 Austria (Europe) complete Group B. The world championship in Monterrey will be the top international baseball competition of the year and will distribute 690 world ranking points -- the third-highest award, behind the PREMIER12® and the World Baseball Classic -- to the winner. The inaugural U-23 world championship in Monterrey, Mexico, is an expansion of the U-21 Baseball World Cup, which was launched in 2014. Nations will be now allowed to utilise their top players up to 23-years-old. At the U-21 world championship in 2014, won by Chinese Taipei, the rosters of National Teams included players from clubs affiliated to the Australian Baseball League, Chinese Professional Baseball League, Korean Baseball Organization, Major League Baseball, Mexican Baseball League, Nicaraguan Professional Baseball League and Nippon Professional Baseball.